BMW added several high-tech features to the new X5, ranging from a head-up display to Adaptive Drive, which reduces body roll during turns. ATHENS - BMW will try some new tricks to spark interest in its second-generation X5. A big portion of the premium SUVs campaign will use novel forms of communication. Internet blogs and Webcasts will supplement traditional ads for the X5, Tom Stepanchak, Munich-based innovations manager for BMWs marketing department, said in an interview at the SUVs press introduction here. BMW declined to discuss its spending on new media, but said it is far less than what it will spend on traditional advertising. The non-traditional marketing includes podcast interviews with BMW executives speaking on the floor of major auto shows and Extreme sightseeing videos on the BMW Web site. One of the videos shows a speedboat racing an X5 to deliver fresh fish to a restaurant in Italy. Stepanchak said the new media is aimed at a small, avid group of fans. Stepanchak, a Californian who headed BMWs 2001 online series of Internet films called The Hire, said the Internet is now a mainstream medium. His goal is to reach enthusiasts who write blogs and frequent Web sites such as video-playing YouTube and online encyclopedia Wikipedia. BMW has twin marketing strategies. Broadcast and print ads boost awareness and build the brand. That worked for the old X5. More than half of the 616,867 X5 buyers since 1999 were new to BMW, said Matthias Hoffmann, head of product management for X vehicles. The second part is a smaller, tightly focused effort to reach new-media types who seek the latest online trends. 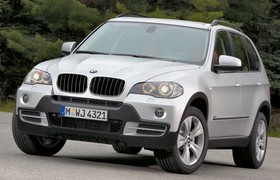 Before the X5 innovations campaign started, a BMW-made video of the new X5 was already on YouTube.